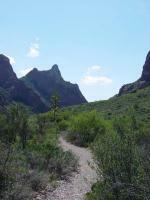 Getting there: The easiest starting point is just a stone's throw from the Chisos Mountain Lodge parking lot. Near the start you'll find a large wooden sign with arrows pointing in various directions towards the trails that start near that point. The Hike: The Window Trail is one of the most popular hikes in Big Bend. It starts near the Chisos Mountain Lodge and descends to a narrow opening in the rim of rock that creates the Chisos Basin. It is the sole exit point for water runoff out of the basin, so obviously you would not want to be near the Window at times of heavy rain. This trail is mostly uphill on the way back, so pace yourself since the going will be harder on the second half of the hike. The trail is easier on the way in than on the way out! There's plenty of flat trail in shade and for the most part the incline/decline is gradual. There are a few stretches with steep rock stairs and a few fun rock piles to climb over. The ascent out of the canyon is intense for the weaker hiker since the descent in is misleadingly easy. The wak itself is rather dull, as it heads down through the Basin... the payoff is the last half a mile, when you enter the narrow canyon chiselled out by Oak Creek and emerge at the WIndow. The view out isn't spectacular, but it's pretty cool seeing the desert through a narrow slit in the Chisos mountain rim. Go very early or late (sunset here is nice) - you'll avoid the crowds, and the walk is mostly exposed with not much shade until the end. This was one of our first, and a tough lesson. it was 106 deg and up hill on the way back...lessons learned. There was no water in the creek so no falls to see (we were told Cattail falls is beautiful when running). We drove to the campground & hiked from there as the mileage is less and apparently you don't miss much. We took a right at the fork up Oak Springs and there is a rocky (safe) ledge but beautiful view from the top, as long as you don't start the steep hike back down. We saw some deer on this trail. The hike "down" to the window is not bad at all. The view from the window is absolutely beautiful. The hike back up the trail can be difficult as you are going up the entire way of the trail. Make sure that you take plenty of water - I always fill up my camel pak when I go. There a lots of rock formations in the Chisos Mountains and the trees/plants are usually nice and green because of the elevation. The Window View Is Incredible! First, the reason why the mileage on my hike is only 4.40 miles whereas other people have logged 5.50 miles is because I caught the trail from the campground area whereas they caught the trail from the Basin Store area. This hike is downhill for the first half and then uphill on the way back. The trail takes you through a scenic canyon and culminates in a water pouroff known as The Window. The view is absolutely spectacular. If you walk out to the edge of the window, be careful as the rock is smooth and slippery. About a 1/4 mile from The Window, you can take the Oak Springs Trail which leads up and over a steep mountain. The signs says it is 2.0 miles, but it seems longer, perhaps because the trail is so arduous. If you decide to take this Oak Springs Trail, be sure you're in good shape and have good balance. The trail is steep and there are narrow areas where a slip could result in a fatal fall. For more than twenty-five years, FalconGuide® has set the standard for outdoor recreation guidebooks. Written by top outdoors experts and enthusiasts, each guide invites you to experience the endless adventure and rugged beauty of the great outdoors. Hiking Big Bend National Park features forty-seven of the finest trails in Texas-from short day hikes to backcountry treks. With this comprehensive guide, veteran hiker Laurence Parent provides all the information you need to get the most out of hiking this natural wonderland.